Not yet ready to give a full evaluation for the Winter 2019 season, I will say that I am overall pleased with the series I managed to get to or currently progressing through now. Only planning to review a choice few next month and the rest to follow later or apart of a separate year end post, Spring 2019 seems to be one of those seasons where I will cut back to finish any stragglers. That being said, I still have a few titles that have managed to lure my attention and wanted to bring attention to 5 that most likely will be what I stick with. With no special rules, this list will exclude any sequels and shorts, the latter going on my list regardless. Synopsis: A world where fairies possess and reside within animals, granting them special powers. By surgically removing and transplanting the organs of a possessed animal into a human, humans can partially summon the fairy and use it as a weapon. Eventually, such individuals were used for war, and were called “Fairy Soldiers.” After a long war, these soldiers lost their purpose, and had to reintegrate into society. From the government, to the mafia, and even becoming terrorists, each tread their own path. The story begins nine years after the end of the war, and centers on the protagonist Maria. Maria is a fresh recruit of “Dorothea,” an organization dedicated to the investigation and suppression of fairy-related crimes and incidents. Even in peacetime, the government is still unstable after the war. Many criminals still have lingering wounds from the previous conflict, and there are terrorist groups bent on revenge. This is the story of Fairy Soldiers seeking their own justice in a chaotic postwar world. Thoughts: Somehow, with these non-sourced projects, P.A Works manages to draw me in. Whether it be the messy synopsis or entrancing music in the promotional video, April can’t arrive soon enough to see what this one has in store. Having a relatively new core production staff (excluding the series composer Ao Jyuumonji) it is just another reason to give it a go. Hoping that all goes well. Synopsis: Hitori Bocchi suffers from extreme social anxiety, she’s not good at talking to people, takes pretty extreme actions, is surprisingly adept at avoiding people, her legs cramp when she overexerts herself, gets full of herself when alone, will vomit when exposed to extreme tension and often comes up with plans. Now she is entering middle school and her only friend, Yawara Kai, is attending a different school. This leaves Bocchi alone, surrounded by new classmates with whom she must make friends before Kai will talk to her again. Thoughts: From the same creator that gave us Mitsuboshi Colors for the Winter 2018 season, Hitoribocchi no Marumaru Seikatsu appears to be a return to form of cute girls doing cute things. Of course, with the synopsis belying a little more than that and the style of writing found in the aforementioned title, it will probably be relaxing, humorous, and encouraging all at the same time. Thoughts: Always happy to see another manga that I have at least finished the first volume for show up. Seeing how “Ao-chan Can’t Study!” is being classified as a TV Short, this one is a really pleasant surprise. Having already fell in love with most of the cast and loving how the first volume concluded, I am happy to see how things go. 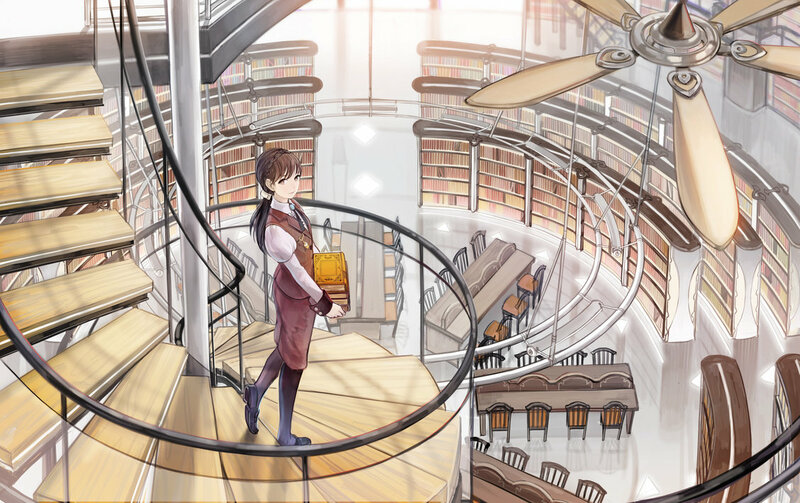 Synopsis: The official website for the Hana to Yume magazine announced a new anime adaptation of the manga. The new anime will be adapting the entire story of the manga. Thoughts: 1999 to 2007. That was the original run for the Fruits Basket manga series. Hard to believe that 20 later we will finally get an anime that aims to animate the story in it’s entirety. With fans that grew up in the age awaiting for the serial release already grown up and most likely parents, it is quite fitting to see this release now. Of course, for someone like myself that never bothered with the manga, it will save me the trouble to hunt down and read 23 volumes. Synopsis: Fifty years have passed since mankind began migrating to the new frontier: Mars. It’s an age where most culture is produced by AI, and people are content to be passive consumers. Thoughts: There is always “that” title every season that you are sure that you will love and most likely, will be darling in everyone eyes, too – if it doesn’t disappoint. Carole & Tuesday seems to be that type of anime. Having done zero research on it other than reading the nebulous description and preemptively reading that it will be 1 out of 14 titles (alongside Fruit Basket, Koto, and Hitori) that will be offered in the late night time slot this season, it should be an entry to get the community. Maybe it will or it will not, but we shall see soon enough…. Honorable Mention: Kono Oto Tomare! Synopsis: In the story, Takezou is the last remaining member of the koto club, a club dedicated to the traditional Japanese string instrument. If he doesn’t find new members, the koto club will be terminated. One day, Takezou is alone in the club room when a student barges in and demands to join. The student is delinquent Chika Kudou, a guy who even scares delinquent upperclassmen at other schools. Thoughts: I’m a sucker for music themed titles and this one is no exception. While having a story element centered around the Koto is a weird one (an interesting instrument most people have no idea exist, I am sure) it is one of those titles that I feel I will be watching for the characters and their interactions more than anything. Then again, after watching some the material that was put together by Square Enix for the manga, I have to admit that I like the idea. If you haven’t, you have watch some the videos that were put together for it like the one below. Just simply amazing! What do you think of the list? Any series you are looking forward to this Spring 2019 anime season? Anything that stood out from last season?